As gasoline prices reach $4 a gallon throughout the nation, pain at the pump seems to have at least one silver lining for drivers and insurers. The rising cost of gas also drives a decline in all traffic accidents, including drunk-driving crashes, according to a new study by Mississippi State’s Social Science Research Center. Researcher Guangqing Chi, an assistant professor of sociology at the university, published his findings in the Journal of Safety Research and Accident Analysis and Prevention. Chi examined a range of factors related to driving-related accidents in the state, including age, gender and race. The study analyzed total traffic crashes between April 2004 and December 2008, comparing gas prices to traffic safety statistics. “The results suggest that prices have both short-term and intermediate-term effects on reducing traffic crashes,” he reports in the journal article. Among other points, the research also shows gas prices having a short-term impact on crashes involving younger drivers and intermediate-term impact related to older drivers and men. Chi said short-term impact refers to immediate effects, for example how a current month’s average gasoline prices affect the same month’s traffic crashes. Intermediate-term impact refers to effects over a one-year subsequent time period. While previous research linked traffic-related fatalities to gas price fluctuations, limited research has shown the effects of prices on all traffic accidents. No research previously examined the link between drunk-driving crashes and gas prices, Chi observed. His research also found significant connections between gas prices and a reduced frequency of alcohol-related crashes. Other researchers contributing to the study include SSRC director Arthur Cosby; David Levinson, an associate professor of civil engineering at the University of Minnesota; and Mohammed Quddus, a senior lecturer in transportation studies at the University of Loughborough, United Kingdom. In addition to global warming, congestion, geopolitical costs, oil spills, and health problems like asthma and allergies, we now have another externality to gasoline consumption to justify a pigouvian tax: drunk driving. A new study by Chi et al (6 co-authors!) 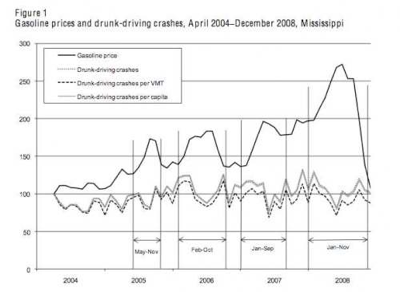 uses data from Mississippi to show that lower gas prices are related to drunk driving related accidents. The authors claim the study is the first to examine this relationship, and is important because from a theoretical perspective the relationship could be positive or negative. The ways that gas could inversely relate to drunk driving are obvious: lower prices make it cheaper to drive and give people more disposable income, which means it’s less expensive go out drinking and driving and people have more money to do so. In addition, the marginal cost of driving a to a farther away bar decreases. Also, higher gas prices may cause people to shift to different modes of transportation, like walking or taking the bus, which (freakonomists aside) are less likely to result in drunk driving accident. A positive relationship is less obvious, but could result if gas prices increases enough that the negative wealth effect (more expensive gas makes you poorer) is severe enough that it creates economic hardship, which can lead people to drink more.On the face of it, the positive relationship seems much less likely than the negative relationship, and this is what the empirical evidence found in this study suggests. The chart below shows the indexed values of drunk driving accidents and gas prices. These results increase the growing gap between the nominal price of gas and the true cost of it, and strengthen the case for a pigouvian tax… not that externalities, efficiency, or empirical realities seem to matter much in the political debate on this issue. A caveat though: these results should not be taken as dispositive but rather suggestive. The empirical analysis is pretty simple, does not get into a really serious attempt to examine causality, and has some fairly serious omissions. For instance, the authors do not control for weather in their analysis. They mention that it would be difficult to aggregate to the monthly level, but I think average temperature would probably suffice. Second, and relatedly, they do not control for seasonality. This is pretty important in a time-series context where you are very likely to see both drunk driving and gas prices increase in the summer and decrease in the winter. Finally, and this is a more minor econometric point, they choose between a poisson and negative binomial regression models by selecting the one with the higher log-likelihood, which I do not believe is a sufficient means to determine whether there is enough overdispersion in the data to warrant the use of negative binomial over poisson. More importantly, they don’t tell us whether the use of negative binomial, or OLS for that matter, affects the results compared to poisson, which would have taken 30 seconds to determine and would tell us something about the robustness of their econometric results. Given that the relationship between prices and accidents disappears for males when the analysis is partitioned by gender, it is not hard to believe that the results are potentially not robust. All that said, the authors do argue that nobody has empirically examined this issue before, and the results are highly theoretically believable. In fact, I find the theory alone strong enough to conclude that a relationship is likely. At the very least when thinking about gas prices we should consider that drunk driving may be yet another cost of low gas prices, and this study should definitely be enough to prompt more research into this. A new Brookings Institution report by myself and Emilia Istrate: Access for Value: Financing Transportation Through Land Value Capture is now out. The worsening financial state of the federal, state, and local governments is a frequent subject in media and political circles. As discretionary expenditures, transportation programs likely face significant changes if they are to cope with spending cuts across all levels of government. These changes would require not only reprioritizing the use of scarce funds, cutting ineffective programs, and improving the performance of remaining programs, but also encouraging states and local partners to find other sources of funding for transportation. Measuring accessibility is an essential tool in such a makeover because it reveals the benefits of a transportation system. Accessibility is the ease of reaching valued destinations, such as jobs, shops, schools, entertainment, and recreation. As such, accessibility creates value. Capturing some of this value would allow state and local governments to invest in the operations, maintenance, and in some cases expansion of their transportation networks. Accessibility, as an outcome-oriented metric, can effectively assess transportation’s economic impact, and capturing the value of accessibility would help states and metropolitan areas develop sustainable transportation funding streams. A Racetrack Model of the Macro-economy: Or what transportation can teach economists. If I understand correctly, many macroeconomists believe that the current economic troubles are due to a decline in aggregate demand for goods. (Or an excess of demand for jobs on the part of labor, or a contraction in the supply of jobs for labor, leading to unemployment, and therefore not enough spending). 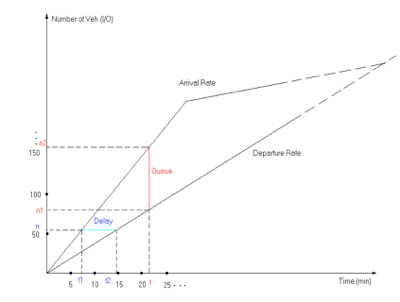 In queueing theory, we have a cumulative input-output diagram. When the inputs at a given time exceed the amount that can be served (or output), a queue results, and there is a loss in terms of delay. This wasted time can never be recovered. Future wasted time can be prevented if we align supply and demand, so the number of people arriving at the back of the queue exactly equals the number of people that can be served at the front of the queue (and we have no standing queue at the beginning of this process). We exactly use the available productive capacity, with no over-production or under-production. Over-production, or attempted over-production results in queueing. Under-production is people sitting on the sidelines when the capital is capable of producing more. In either case there is wasted labor (either queuing or people on the sidelines). We can map the economy as a racetrack (see movie below). Upon passing the some point, let’s say the South-East “corner” of the racetrack, and call that point “Go”, money is exchanged. People are paid for their work. Flow (vehicles per hour) past a point is the analog to GDP, and is the measure of the productivity of the system. The economy is maximally productive when vehicles circulate on the road as fast as possible. We can increase output by increasing labor productivity (the speed at which drivers drive, and their reaction time when someone ahead slows down), thereby reducing headways. Racecar drivers are more productive that normal drivers, because they have greater skill, but they might be troublesome if they increase the risk of crash. We can increase output by adding labor (more drivers) if we have increased productivity, or if we have remaining under-utilized productive capacity. We can increase output through technological advances, like driver-assistive vehicles that allow cars to follow more closely. We can also increase productivity by adding capacity to the road if there are more vehicles that want to use the road than currently can. Reinvesting in the road, rather than paying workers more now, makes sense for an economy that expects to grow either due to a larger population (more cars) or higher productivity (drivers who can driver faster and closer at the same safety level). We will lose long term productivity if we allow capital (the road) to wear out without renewal, preservation, replacement, repair, or rehabilitation. The risk of over-heating is a crash (literally), two cars collide, slowing down the road for everyone else, since productivity drops, fewer people get paid, etc. Driving is a trade-off between value of time (I want to driver faster to save time) and value of life (I want to drive slower to decrease the likelihood of death from crash). Labor is a trade-off between production and consumption. If everyone produces and no-one consumes, no-one can pay the producer. It is our patriotic duty to consume, even if that contravenes the Protestant work-ethic. A central planner could come in and tell the racetrack to hire more workers (drivers), induce the firm to hire more workers (by lowering some cost of hiring such as taxes or regulation or required benefits), seize the firm and hire more workers itself, or open up a bypass to the firm and hire these workers itself. This would increase revenue in the pockets of consumers, and consumer spending, assuming people thought this change was permanent. In this story, the deadweight loss of unemployment would be eliminated in the short run. The problem is the long run dynamics. In the long run, people tire of the good that is being produced, or its market saturates, and consume less of it. Then unless the firm retools to match demand, it has to lower employment. A new firm, with a new bypass, could come in, create a new good people are interested in, hire workers, and so on. These “Gales of Creative Destruction” sweep the old firm/economy/racetrack away. The real world is comprised of millions of bypasses (firms) which transform labor and capital into goods, and labor itself is not homogeneous, each worker has her own path from consumption to production. The question is then empirical, whether a short-term “stimulus” by hiring more workers and eliminating that dead-weight loss, but also eliminating incentives to invent and create by reducing the risk of unemployment, outweighs the incentive effects. We then get to the empirical question of whether there is excess productive labor sitting on the sidelines in the real US economy (e.g. as indicated by a relatively high unemployment rate), or whether those excess workers are just unproductive or negatively productive, i.e. drivers who would just gum up the works for other drivers (because, to extend the analogy their driving skills are sufficiently poor to increase the likelihood of crashes, etc.). I expect the first is true, that is, there is excess productive labor, and the imperfections of the economy, stickiness of labor, regulation, mis-information, animal spirits, etc. are leading to less productivity than the US, and certainly the world, might achieve given existing technologies and labor pools. That said, whether just dumping money into the system will lead to the economy actually moving faster I think is still an open question. That money comes from somewhere, either devaluing the currency, or future earnings. But if productivity creates wealth, and increasing the size of the active workforce increases output, output that would otherwise be lost forever (just as when a plane takes off, it can no longer fill a vacant seat), it would seem to make sense to borrow from the hopefully wealthier future to increase output now to fulfill our hopes that the future will be wealthier. “Who should do the borrowing?”, the central planner or millions of individual planners, is also an empirical question. There are always tradeoffs between economies of scale and span of control. There is also the information problem (Hayek’s Fatal Conceit) about directing the money, as well as the belief problem (Keynes’ Animal Spirits) which suggest that if everyone believes things are going well, they will invest, and if they believe things are going poorly, they will disinvest, fulfilling their own prophecy. If capital is indeed sitting on the sidelines because people’s beliefs about other people’s beliefs are negative, the confidence game that is the economy will come to a screeching halt. This self-fulfilling prophecy phenomenon may require a possibly counter-intuitive, contra-cyclical contrarian to set right, the scale of which may need to be central (and large) to be effective. This empirical question is unresolvable (and following Popper, all hypotheses are unprovable anyway), because we have only one economy, and are thus running only one experiment, there is no control. Econometrics could come in and use a panel data set of many historical events over many places and tell us some things, but I believe any conclusions from these kinds of statistical models will be contentious rather than consensus. Caveat. I know this is a grossly over-simplified model, but hopefully it elucidates some things.